Life in your pet-friendly Springs luxury apartment home is much more pleasant if your dog is as well-behaved as you would expect a human roommate to be. Don't let a rambunctious pet cost you time, money and peace of mind. Save your home and your sanity with these helpful tips. Our pet policy permits most dog breeds, so you have many options. Choose one with a more laid-back personality that is better suited for apartment living. Keep in mind that there's not always a direct correlation between size and temperament. Some larger breeds, such as Great Danes, are gentle and affectionate, while some terrier breeds and other small dogs can be high-strung and energetic. Pent-up energy is a main cause of misbehavior in dogs. Make it a habit to spend time each day providing your pet with some physical activity, whether it's a walk around the neighborhood or a romp in our on-site off-leash dog park. While our Springs luxury apartment homes provide a high degree of privacy, constant barking can get on the nerves of even the most patient pet owner, and even more on the neighbors. Instead of punishment, use positive reinforcement to teach your dog to stop barking. Puppies in particular are known for their enthusiastic biting, but it's not so adorable when they carry the behavior into adulthood. Complete cessation of biting is unrealistic, so bite inhibition training teaches dogs how to use restraint with this natural instinct. Certain behaviors can sometimes be a sign of health problems. Make sure you keep your dog up-to-date on wellness exams and vaccinations, and consult your vet on any particularly worrisome issues. Professional dog trainers have experience with all breeds and temperaments, so they have successful methods for dealing with destructive and harmful behavior. The Association of Professional Dog Trainers (APDT) offers a database that's searchable by geographic location, as well as tips for finding the right trainer. Does your pet suffer from separation anxiety? 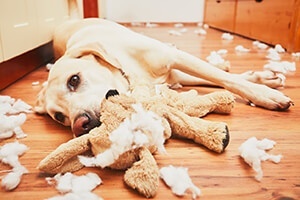 Some dogs resort to destructive habits to cope with loneliness and boredom. Your pet may benefit from doggy day care, either one-on-one or at a pet care facility. Springs is proud to offer dog parks, pet spas and other amenities for our four-legged residents. Stop in and talk to a member of our on-site management team about our generous pet policies.